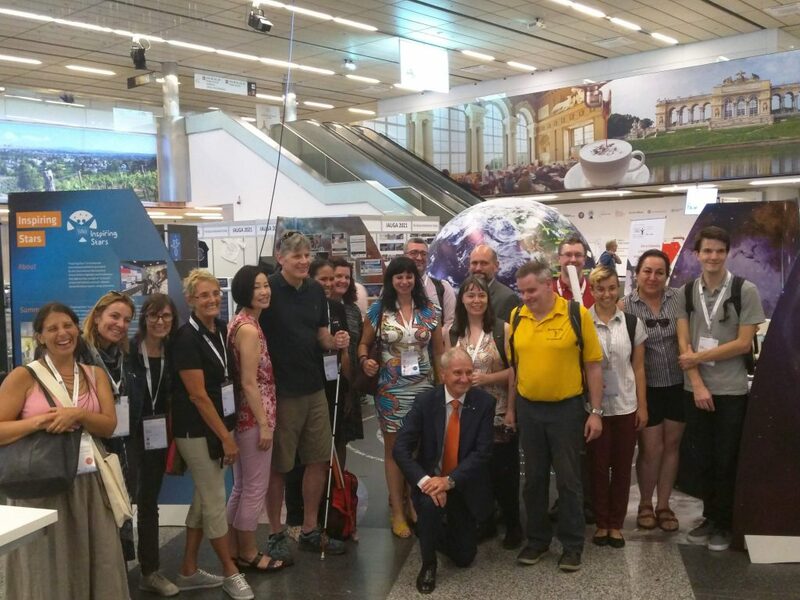 The XXXth General Assembly of the International Astronomical Union Vienna was held from August 20-31, 2018 in Vienna, Austria. For 2 weeks, the astronomy community from around the world gathered to discuss science, outreach, education, development in addition to administrative and business meetings. 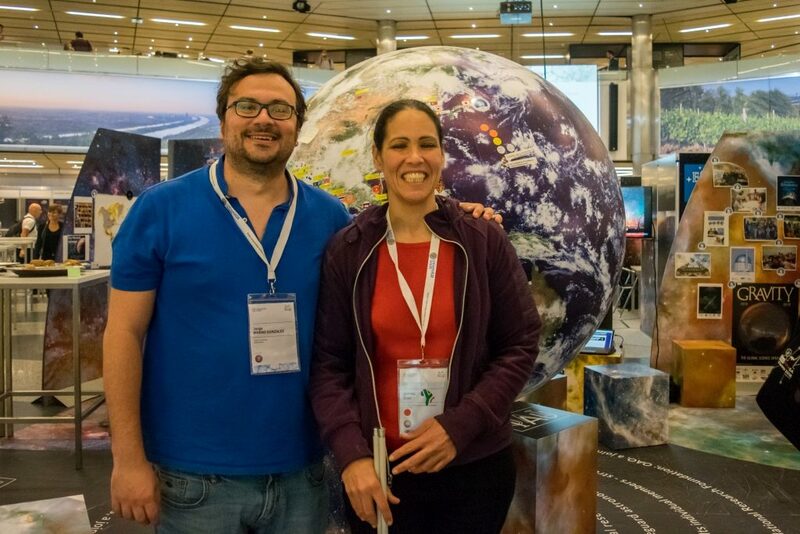 The OAD team was present at the GA and shared the IAU Exhibition space together with the Office for Astronomy Outreach (OAO), IAU100 anniversary team, and the IAU Inspiring Stars inclusive exhibition. The centre piece of the exhibition was a 1.5 m diameter Earth ball with markers for location of OAD funded projects, OAO outreach coordinators, and translator-volunteers. 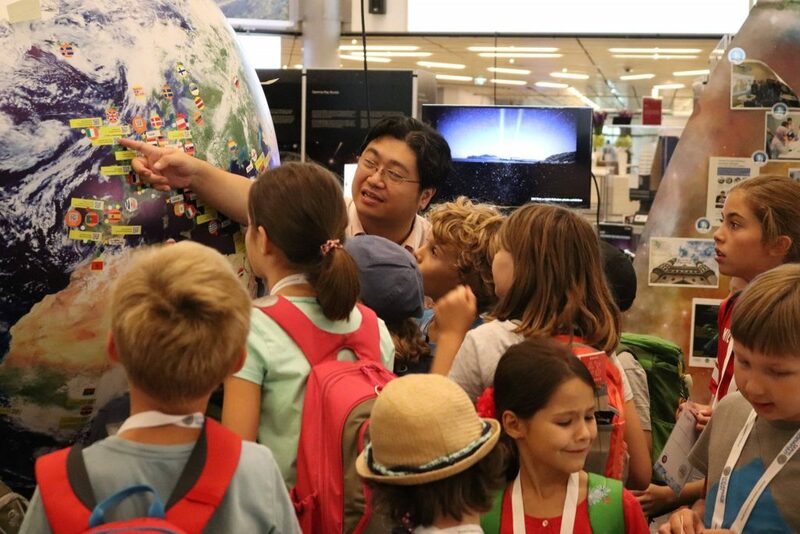 For 2 weeks, the IAU offices interacted with the 3000+ GA participants at the exhibition space. The OAD had prepared a number of brochures and goodies to be given away. “Inspiring Stars” exhibition was launched at the IAU General Assembly. It is an itinerant international exhibition to highlight world initiatives that address the concept of “inclusion” at (but not limited) outreach, didactic, and professional aspect,s using astronomy. It is a collaboration between the IAU Secretariat, the IAU Office of Astronomy for Development, and the IAU Office for Astronomy Outreach, with the support of the American Astronomical Society (AAS). 2019 will mark a year-long celebration to increase awareness of a century of astronomical discoveries as well as to support and improve the use of astronomy as a tool for education, development and diplomacy under the central theme “Under One Sky”. IAU100 celebrations were officially launched at a special session at the General Assembly in Vienna. The IAU 100 Years celebration in 2019 will consist of global and regional events that will reach a worldwide audience of millions of astronomers, industry leaders, educators, and more. Both the OAD and OAO organized focus meetings on Astronomy for Development and IAU’s role on global astronomy outreach respectively. More information on the sessions soon. In addition, OAD team participated in a number of meetings, including the Young Astronomers Lunch, Division Day meeting etc. More information on the GA events in the OAD newsletter and OAO newsletter. The team for the IAU Inspiring Stars inclusive exhibition.